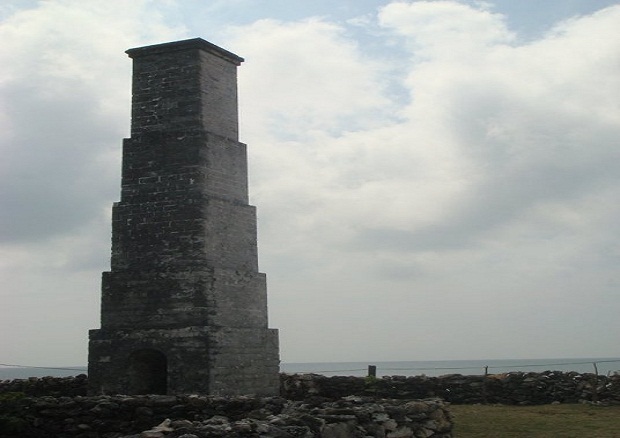 Nagadeepa Vihara, an ancient Buddhist temple is located in Nagadeepa, one of the islands in a cluster that huddles close to the western coast of the peninsula with Palk Strait shaping around it. 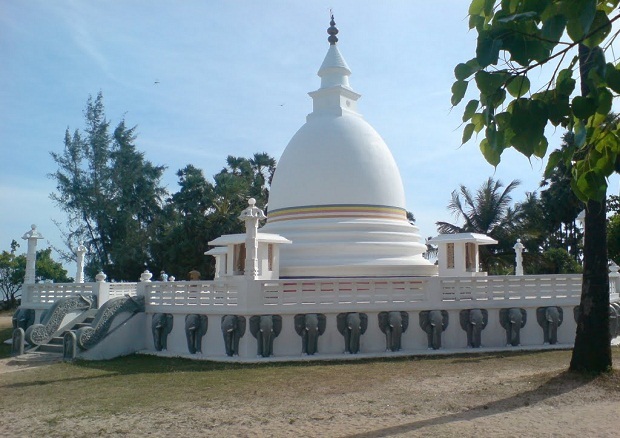 The stupa of modest dimensions commemorates the Buddha’s third visit to Sri Lanka. Image house next to the stupa features a fine golden Buddhist statue. 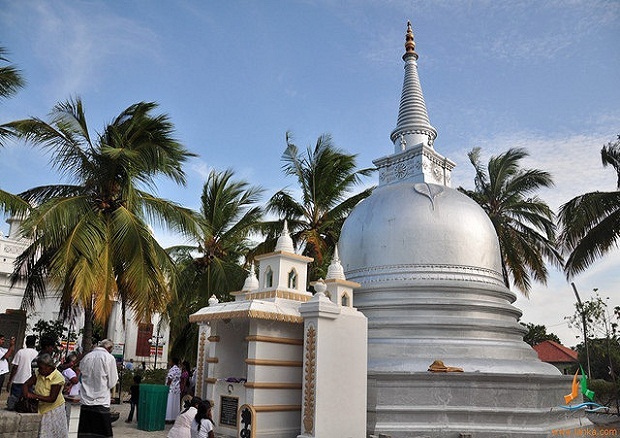 Dambakola Patuna (Jambukola Pattana) is located about 20 km from Jaffna town and 10 km from Kankasanthurai of the Jaffna Peninsuala, the northernmost peninsula of Sri Lanka. The distance form Colombo is 427km by A3 and A9 main motor roads. Dambakola Patuna is the sea port where the Buddhist nun Sangamitta Therani arrived in Sri Lanka bringing the southern sapling of the Bo or Peepal tree, the sacred Jaya Sri Maha Bodhi at Bodhgaya in India, in whose shelter the Prince Siddhartha attained supreme enlightenment, thereby becoming the Gauthama Buddha. Today the sacred tree is known to be the oldest recorded tree of the world and known by the name of Jaya Sri Maha Bodhi of Anurdahpura. 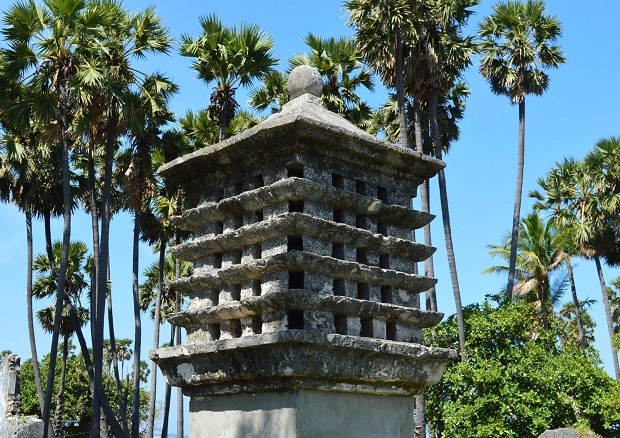 The small stupa and the temple at Dambakola Patuna (Jambukola Pattana) are modern constructions. The modern statue of Sanghamitta Therani was established there at a ceremony in 2010. Kantharodai, described as Kadurugoda Temple in the Sinhalese chronicles, is a 3rd century BC Buddhist site located about 10km north of the city of Jaffna, and 2km west of the village of Chunnakam. 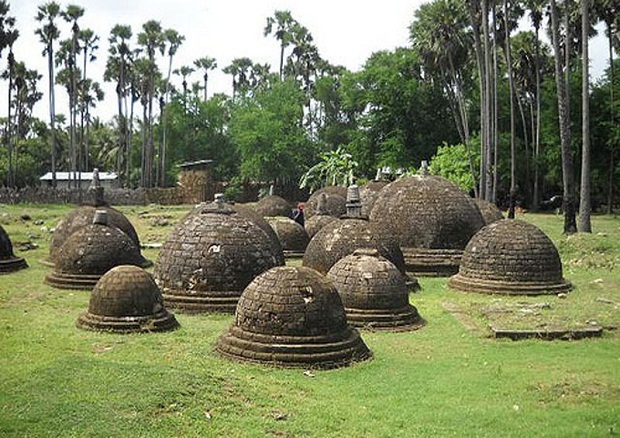 A cluster of twenty miniature Dagobas, ranging in height from one to three meters, are unlike any other Buddhist religious sites in Sri Lanka. It is believed each of the miniature Dagobas has the remains of Buddhist monks enshrined therein. The site is yet to be subjected to archeological exploration. 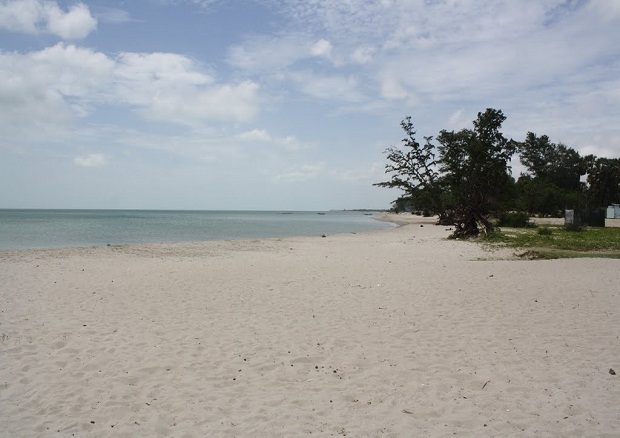 Casuarina beach is one of the famous attractions in Northern Sri Lanka and it is just 20KM from Jaffna city. It is in Karainagar suburb. 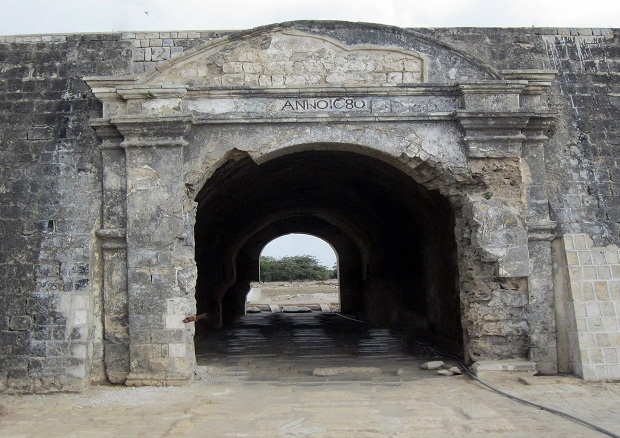 Situated on the south side of the Jaffna peninsula at the water’s edge of the lagoon, the ancient fort in Jaffna is the second largest existing fort in the Island. Originally built by the Portuguese in 1619 and re-built and expanded by the Dutch during the second half of the 17th and the 18th centuries to facilitate trading activities of Sri Lanka’s northern region indicate not only of Jaffna’s strategic importance to Europeans but its significance throughout Sri Lanka’s history. The Jaffna library was one of the best in Asia before the war. Now it is restored to its original state and is open for public viewing. 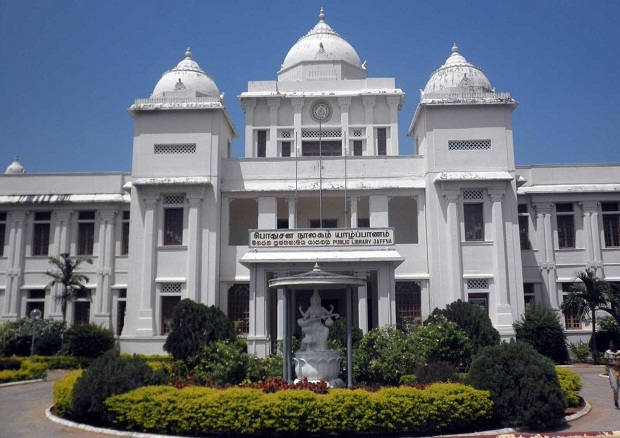 It is one of the monumental buildings in Jaffna and situated at very close to the town. 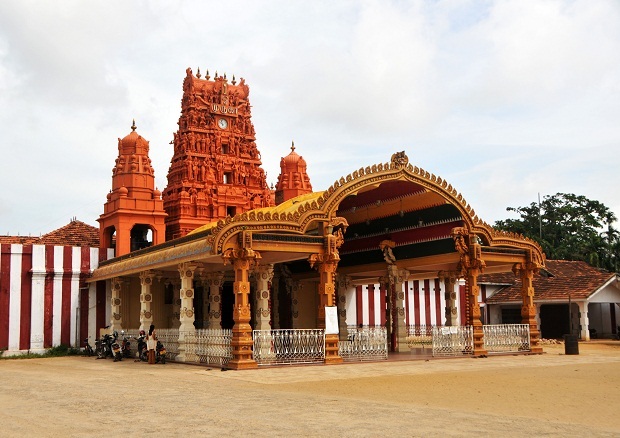 Nallur Kandhaswamy Kovil, main landmark of Jaffna located 3km northeast of the town center, dedicated to the Hindu God Murugan was built in 1807 during the British occupation. The original shrine, a devalaya featuring the statues of Hindu Gods and Buddha, built by the Prince Sapumal of Kotte Kingdom, the vice royal of Jaffna Peninsula was destroyed by the Portuguese, on the 2nd of Feb 1625. To date at the Nallur Kandhaswami Kovil, prayers are recited in the name of Prince Sapumal of Kotte. According to the head of the Franciscan order in Ceylon, father Negaro, who had studied all available records, while in the Kingdom, Prince Sapumal after ascending the throne of Kotte as King Buvanekabahu VI had decided to populate the Northern area's as majority of these areas were deserted. Today the Kovil has developed into an enormous complex encompassing numerous shrines accessed by richly decorated corridors. Within the complex are a beautiful courtyard and a large tank. Since the temple was built in the year 1734 to 1749, it contained a shrine dedicated to an Islamic Sufi saint. However in the year 1749, dargah, the vault of the Islamic saint was removed by the Hindus. The road from Chunnaakam to Kopay passes the 'Nilaverai Deep well'. 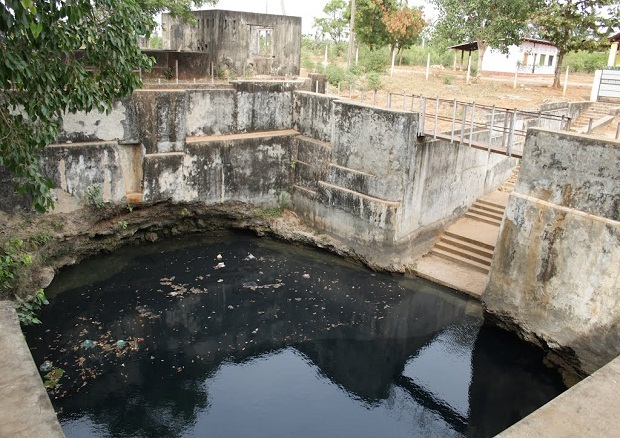 The picture shows the surface of the fresh water deep well. This well has an inexhaustible supply of fresh water. Delft Island is also notably one of the few places in Sri Lanka where this tree thrive. 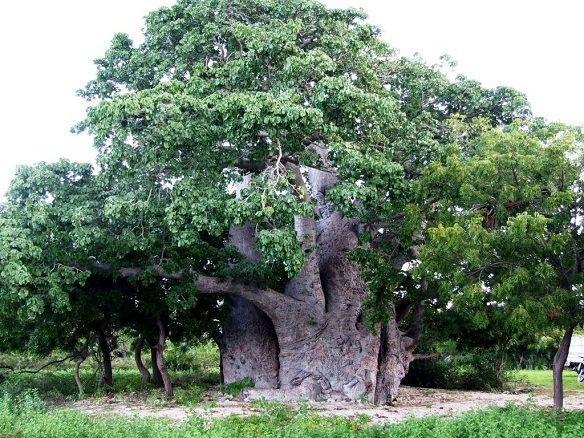 The Baobab tree, native to Africa, was bought by Arab sailors to feed camels which they stationed in the area. Although camels aren’t found today, few baobab trees are still there on the hot sandy Mannar region also. Bao-bab belongs to the family of Bombacaceae. It appears strange and barrel like enormous trunk, which tapers into branches. When the leaves are shed, the tree gives the impression that it had been planted upside down. This is situated in the vicinity of the present Delft Hospital premises. 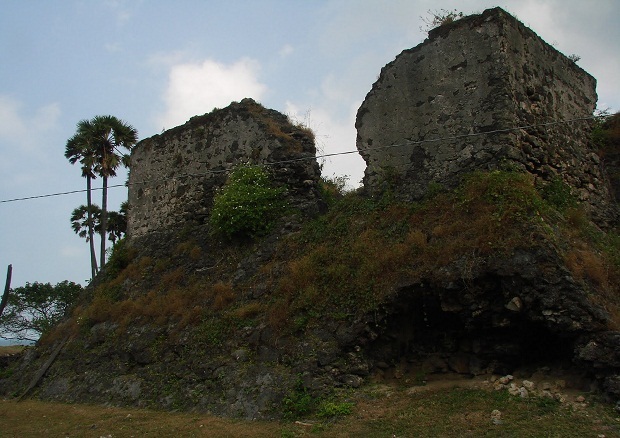 This fort was made of corals and built by Dutch. The fort has two floors. Down floor has five rooms. The specialty is, It was made without keeping windows. According to the evidence the down floor was used to keep prisoners and gun powder. The upper floor was used as official quarters and has windows and the rooms are large. This fort was made with resources to face enemy attacks. This is situated near to the Dutch fort. Pigeon holes were used to rest pigeons who was used by Dutch empires to send messages to Jaffna. There are 70 holes in the house. The message was tied to the leg of the pigeon and after releasing the message pigeons used to fly back to the same hole. 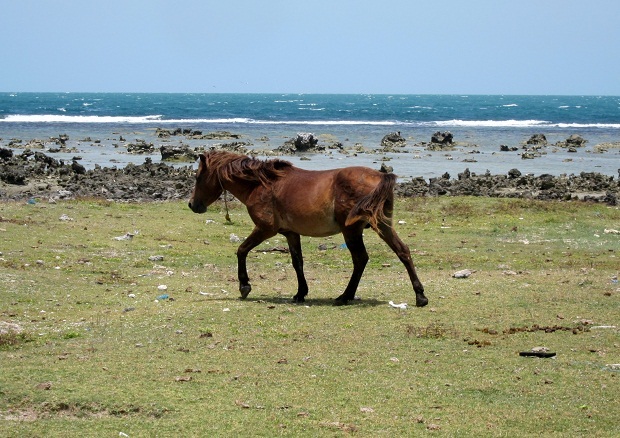 One part of the island is used by villagers and the other part is used by horses and cattle. After bringing wild horses they had brought plants to feed them as well as medicinal plants. The Biobab tree is a plant which brought to feed the horses. The population of wild horses is around 500. Early in the morning these horses come to grasslands and when the heat is high they are going to covers. Though there is water in one part of the year, the rest part they are suffering due to lack of water. This is a light house built by Dutch in ancient time. During the time electricity was not used, a simple method was used to guide the sailors to detect the land. Hence, fire is set at the bottom of the tower and light was sent through a tube and it remits bright light on the top of the tower. This light is enough to guide the ships and ferries which sail far away from the land.